It looks like after the typical onslaught of award-worthy films make their debut in December we can expect January to be the start of another cinematic lull in the year. Movies reserved for release in this period tend to be safe bets, and Extraordinary Measures, which launches the new CBS Films division, is just as predictable as you would guess. 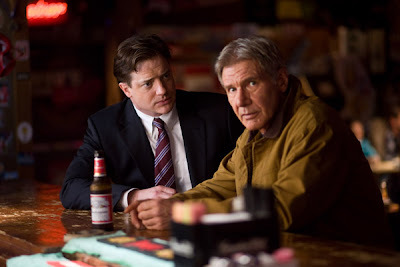 Based on Geeta Anand's The Cure, the medical drama is a two-hander that follows John Crowley (Brendan Fraser) as he recruits Dr. Robert Stonehill (Harrison Ford) in an effort to develop a cure for the rare genetic disorder that afflicts Crowley's children, Pompe disease. There are some interesting plot details in the early part of the film, as Crowley leaves his lucrative job with Bristol-Meyers Squibb to co-found a biotech start-up with the idiosyncratic Stonehill. And Measures is at its most fascinating when it explores how Fraser's Crowley deals with the intricacies of the business compromises necessary to fund a search for the cure. Fraser (The Mummy) is a surprise. Pretty solid dramatically, he deftly switches gears between concerned parent and pragmatic businessman. The most intriguin section of the film depicts the ins and outs of acquiring funding for Stonehill's research. Gambling that his start-up will survive just long enough to develop something of interest to a larger corporation, Crowley's desperation for a cure soon overcomes him as time starts running out for his children. And Fraser modulates his emotional responses effectively, avoiding any histrionics one would expect from an actor who has never quite displayed such a range in previous performances. However when director Tom Vaughan takes Measures ouside the realm of medical procedural for too long it gets bogged down in syrupy sentimentality. Keri Russell (Felicity) is completely wasted as wife Aileen Crowley. A scene in the film's first act showing the Crowleys trying to steal a moment for physical intimacy during their kids' nurses' shift-change window displays some promise that the day to day inconveniences of caring for a loved one full time would be explored through the character of Aileen. Instead, the script relegates Russell to being a mere sounding board for Fraser, a cipher who cries on cue whenever the chips are down, and just about the kind of heroine you'd see in any old Lifetime cable movie-of-the-week. Ford executive produces the feature, a bit of shepherding you typically see when an actor wishes to save a notable character part for himself. But if there is anything distinctive in the stereotypically kooky character of Stonehill—a doctor who, big surprise, loves to ignore others as he focuses on his research while the rock music blasts loudly out of his office—it's exorcised by his one-note performance of crankiness. Perhaps a strange one-scene cameo by Dee Wallace (E.T. : The Extra-Terrestrial) which hints at a flirtation indicates that some scenes between her and Ford were cut; as does a later scene, when a silhouette of a woman lying next to the (thus far sexually inactive) doctor distracts from the midnight phone call he receives. Ford and Wallace would have made for an interesting couple and a nice way of fleshing him out. Extraordinary Measures ultimately falls short by residing within the limited scope of the traditional medical melodrama. The film's best moments places Fraser's character in quite the crucible, as he must weigh the practical considerations of marketing a viable treatment against the brutal odds of survival which his children face. It should have jettisoned more of the emotional baggage to explore the procedural aspects of funding medical research, fresh territory for movies of this type. Extraordinary Measures is scheduled to open on January 22, 2010. I do like it when movies focus on different aspects of well-worn material, such as the interdepartmental communication in ZODIAC, so yes, the funding aspect of EXTRAORDINDARY MEASURES might have been an interesting surprise. It's too bad that it sounds like it's going to be exactly what it appears to be. Harrison Ford...what the hell happened to you? Seriously, Bill. I was switching by Spike TV the other day during their umpteenth marathon of the STAR WARS series and caught a moment with the young Ford. He was so nimble and quick witted, dependable for both leading man and comic relief moments in that series and INDIANA JONES. Say what you will about CRYSTAL SKULL, but I was relieved at how he seemed to relax back into the role despite the many years gone by, smiling and cutting it up more than I've seen him in do in a decade. But that anomaly aside, he's stiffened up so much he's practically creaking. The last time I caught Harrison Ford having fun was way back in Working Girl. Not a great movie, but he was loosey-goosey in it. Yet even his dramatic performances, scowl and all, have been unimpressive since his mid-80s work with Peter Weir. I keep hoping for a comeback, but it's looking less likely. One interesting note about Extraordinary Measures: It was edited by the legendary Anne V. Coates, for five decades editor of films as varied as Lawrence of Arabia and Out of Sight, and still going strong in her 80s. "Dr. Stonehill's" real name is Dr William M Canfield of Oklahoma City. He is one of the leading Glycobiologists in the world. If it weren't for his tireless dedication to the research and development of a successful treatment for Pompe, the Crowley children (and others like them who suffer from this horrible disease) would not be where they are today. Too bad that the 'other hero' to this story is passed off as a fictional character and not given the credit that he so well deserves. I don't know this for a fact, but I suspect Stonehill was fictionalized because Canfield may have objected to some aspect concerning the way he or his contribution to the treatment are depicted. Thanks for bringing Canfield to our attention.